TDS. The most common measurement of reverse osmosis performance. TDS stands for “total dissolved solids.” It is tested with a simple meter that passes a small electrical current through the water and measures how well the water conducts electricity. The more “dissolved solids” the water contains, the better it conducts electricity, and the higher the reading on the meter. Conversely, low conductivity means few solids and a low reading on the meter. 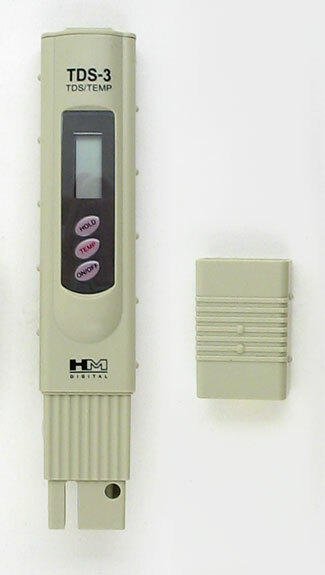 The meter in the picture can be used to measure the tap water as well as the RO water. It is the comparison of the two, called “percent rejection” (see below), that really tells how well the unit is performing. A Modern Total Dissolved Solids Tester Gives You An Instant Picture of the Effectiveness of Your RO Unit. You Can Also Use It to Test Your Tap Water for Comparison. Most municipal tap water will have a TDS reading of 500 parts per million (ppm) or less. (The reading may be expressed as ppm, parts per million, or mg/L, milligrams per liter. Ppm and mg/L are essentially the same.) The EPA regards 500 ppm as the maximum recommended TDS for drinking water (although the water of many cities exceeds this). TDS is merely a way that performance is measured. A high TDS does not indicate that water is contaminated with dangerous pollutants. It means mainly that it has lots of minerals in it. TDS consists mainly of minerals like calcium, magnesium and sodium. The more of these solids that the RO membrane “rejects” (removes), the better it is working. Tap water TDS minus RO water TDS divided by tap water TDS times 100. 289 – 16 = 273/289 = .9446 X 100 = 94% rejection. This means that your RO unit is rejecting (removing) 94% of the solids from your tap water. It is safe to assume it’s doing an excellent job reducing not only the minerals in the water but also contaminants like lead, arsenic, and fluoride. Measuring TDS is an effective means of determining the overall performance of your RO membrane. An easy way for determining how many gallons per day your RO unit is producing is to measure how many milliliters the unit produces in a minute and multiply the result by 0.38. To do this, turn off the valve on your storage tank so that no water can go in or out, then lock open the ledge faucet on your sink top. The small stream or drip that comes from the faucet is the amount of water the RO unit is producing in real time. Catch the drip or stream for one minute in a measuring cup that shows milliliters. Multiply the milliliters produced during one minute by 0.38 to get gallons per day. For example, if your unit produces 60 milliliters in a minute, multiply by 0.38 and you’ll see that your RO unit is making about 23 gallons of water in a 24 hour period.